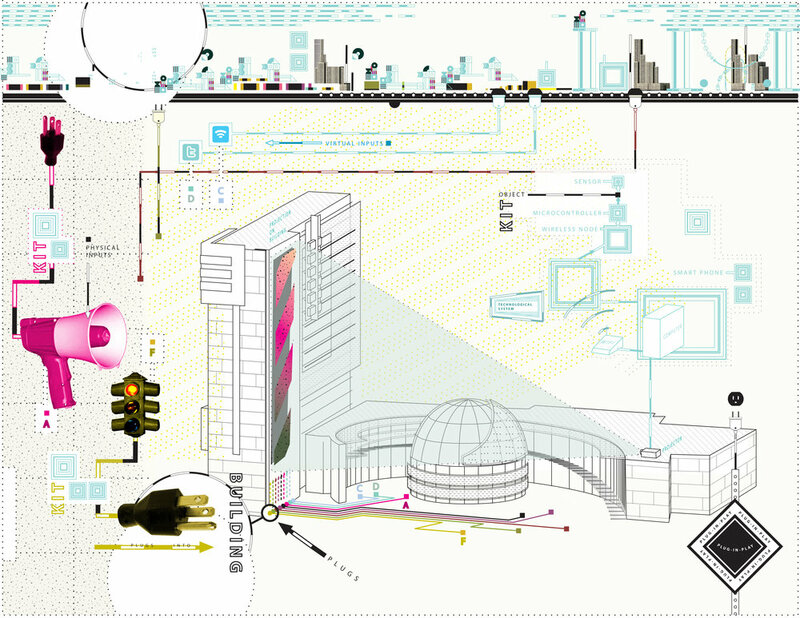 Plug-In-Play is an interactive installation consisting of an architectural scale projection and a series of networked input platforms representing a playful take on the future of the connected city. 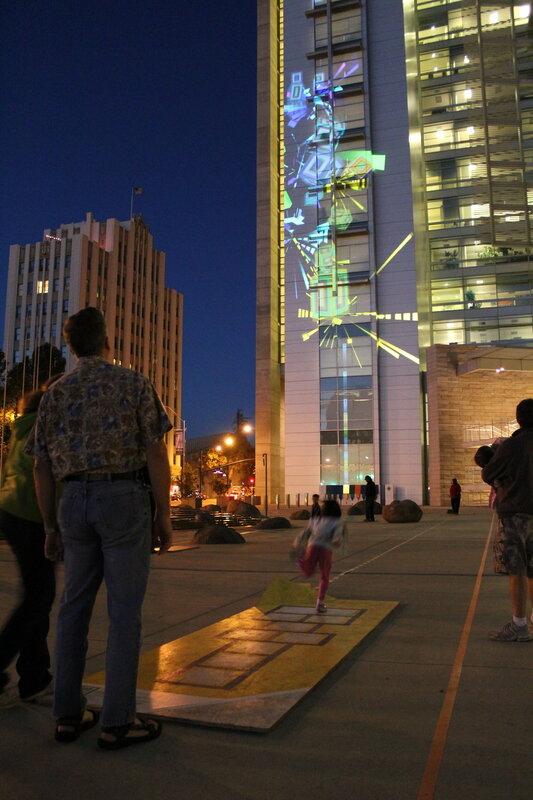 It was the central installation of the 2010 01SJ Biennial in San Jose, CA by the LAB at Rockwell Group. Our initial research examined existing conceptual precedents-such as Peter Cook’s Plug-in-City (1964)-and real-word examples of these ideas coming to life-e.g. “Internet of things” organizations such as Pachube. ZERO1 is a Silicon Valley hybrid arts organization. Their mission is to connect creative explorers in art, science, and technology to provoke and explore new ideas that build engaged and vibrant communities. Silicon Valley and San Jose have a unique position of being specific places while also being at times a very placeless sprawl of office parks. So often when people come to San Jose they seek an authentic experience of “seeing” Silicon Valley in all of its innovation and groundbreaking activity, but it can be hard to find the center of this experience. Plug-In-Play was a response to the theme of the 2010 01SJ Biennial: “Build Your Own World.” This theme is predicated on the notion that innovative individuals worldwide can make a difference by building unique and distributed city-wide platforms for creative solutions and public engagement. The Rockwell Group digital interaction LAB took this theme as a challenge to show the growing connection between the physical and virtual in urban life, and to explore the role this connection plays in shaping the cities of tomorrow. The second challenge we were faced with was the site itself, Richard Meier & Partners Architects’ San Jose City Hall. The large, iconic site provided both a practical as well as conceptual challenge: how were we to address such a large and unique site, and how could our installation meaningfully address the location as a civic space? Thus, the problem we set out for ourselves was to acknowledge and explore the growing role of technology within the context of civic space and to do so in a way that both activated the architectural space and created a physical link to the virtual world. We focused our work on realizing our ideas on a practical level, which we accomplished through a series of iterative prototypes. 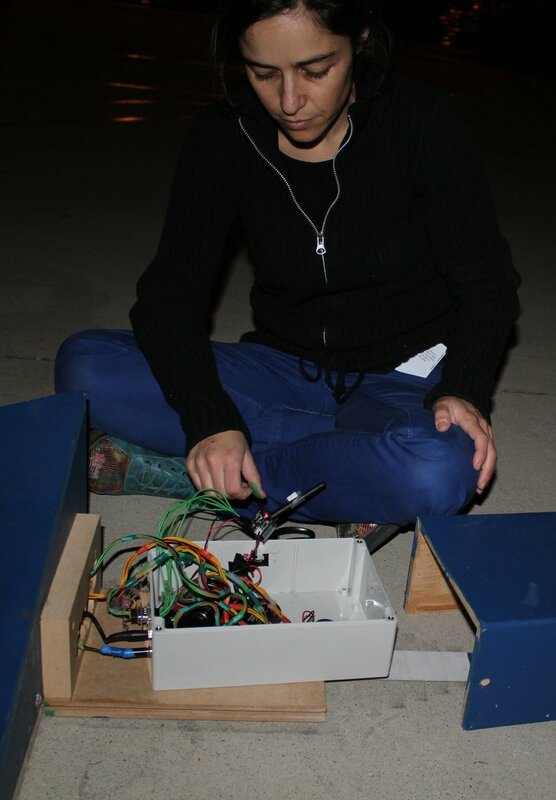 Our first mock-ups were hacked together from milk crates and paper cups embedded with Arduinos and sensors. 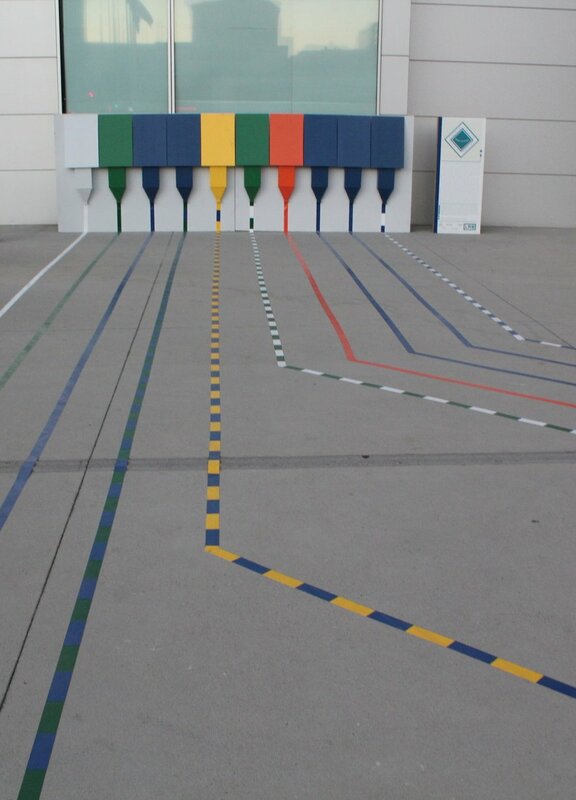 Each successive stage added complexity: enclosing sensors in existing objects, moving the sensors from wired communication to RF transmitting, and so on. We were able to refine the pieces to the point that we created our own custom printed circuit boards for each sensor. Our final prototyping stage centered around connecting each individual piece (separate interaction “stages” for physical and virtual input) into an architectural scale environmental choreography system. Joshua Walton, James Tichenor, Keetra Dean Dixon, Brett Renfer, Adi Marom, Tucker Viemeister, Zack Boka, Lars Berg, Ellen Haller, Chris Allick Projection Equipment: SenovvA, Inc. Commissioned by Zero1 and The City of San Jose.